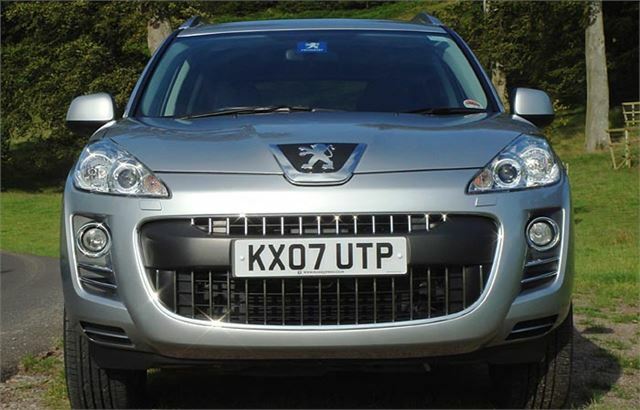 The Peugeot 4007, Citroen C-Crosser and Mitsubishi Outlander are members of the fastest growing species in the World. Memo to Friends of the Earth: 4x4 SUVs are now reproducing at a faster rate than any other type of vehicle. At the last count there were at least 65 different 4x4 SUVs either available now or about to be on the UK market. Here’s a list: Audi Allroad, Audi Q7, BMW X3, BMW X5, BMW X6, Cadillac SRX, Citroen C-Crosser, Daihatsu Terios, Dodge Nitro, FIAT Panda 4x4, FIAT Sedici, Ford Kuga, Honda CR-V, Hyundai Tucson, Hyundai Santa Fe, Hyundai Terracan, Jeep Compass, Jeep Patriot, Jeep Wrangler, Jeep Cherokee, Jeep Grand Cherokee, Jeep Commander, KIA Sportage, KIA Sorento, Land Rover Freelander, Land Rover Defender, Land Rover Discovery, Lexus RX, Mazda CX-7, Mercedes ML, Mercedes GL, Mitsubishi Outlander, Mitsubishi Shogun, Nissan Qashqai, Nissan X-Trail, Nissan Murano, Nissan Pathfinder, Nissan Patrol, Peugeot 4007, Porsche Cayenne, Range Rover Sport, Range Rover, Renault Koleos, SEAT Altea Freetrack, Skoda Octavia Scout, Ssangyong Kyron, Ssangyong Rexton II, Subaru Forester, Subaru Outback, Subaru Tribeca, Suzuki SX4, Suzuki Jimny, Suzuki Ignis 4GRIP, Suzuki Grand Vitara, Range Rover, Range Rover Sport, Toyota RAV-4, Toyota LandCruiser LC, Toyota Landcruiser Amazon, VW Tiguan, VW Touareg, Volvo XC60, Volvo XC70, Volvo XC90. However, our tree hugging friends need not be unduly alarmed. Many of the new generation of 4x4 SUVs actually emit less CO2 than older model family hatchbacks. 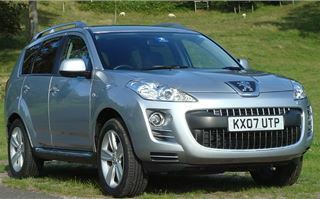 And the new Peugeot 4007 is no exception. Its 191g/k is lower than the old shape MINI Cooper S.
Like the Mitsubishi Outlander of which it and the Citroen C-Crosser are really mildly repannelled clones, it’s good to drive and conveys a satisfying impression of Japanese build quality. 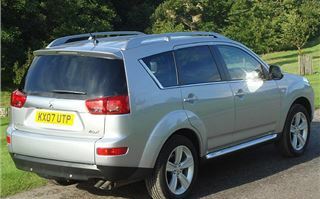 Its great asset over the Outlander is its excellent PSA/Ford 2.2 litre twin turbo diesel engine. 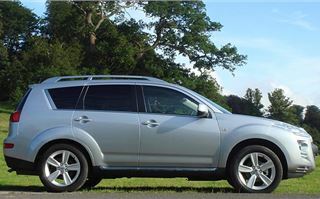 The same one you’ll also find under the bonnet of the Landrover Freelander II, and from the autumn in the Outlander too. 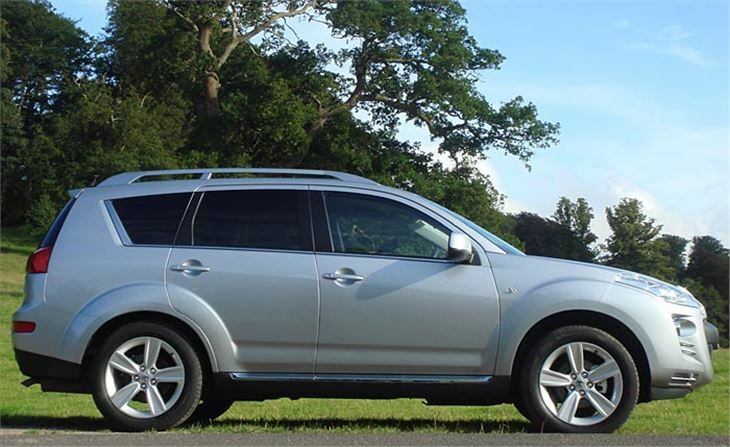 It makes a big difference because where the 140PS VAG diesel in the Outlander lacks low down torque and has to work hard, the PSA 2.2 seems to have exactly the power the vehicle needs. It’s relaxed. It’s pleasant. It doesn’t annoy or irritate in any way. 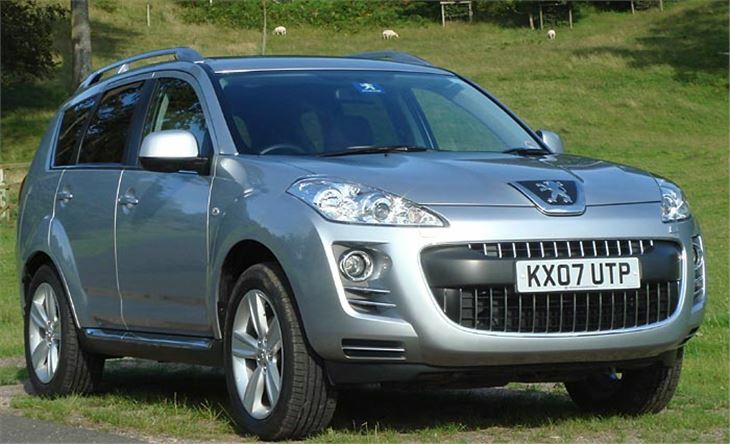 And 0-60 in 9.6 seconds isn’t to be sniffed at for a 7 seater 4x4. It’s also good to drive. Selecting Automatic 4WD sharpens up the front-end Audi quattro style. It feels a bit stiffer than a CR-V, without being any less comfortable. In any kind of inclement weather it’s worth putting it into Auto 4WD, and only using 2WD for dry motorways, cities and suburbs. 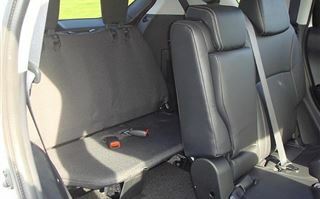 Inside you get five comfortable seats, the rear three split, sliding and slightly reclining 60:40 with a sort of trigger mechanism that tumbles them forwards leaving a completely flat load floor with the folded seats as a bulkhead. 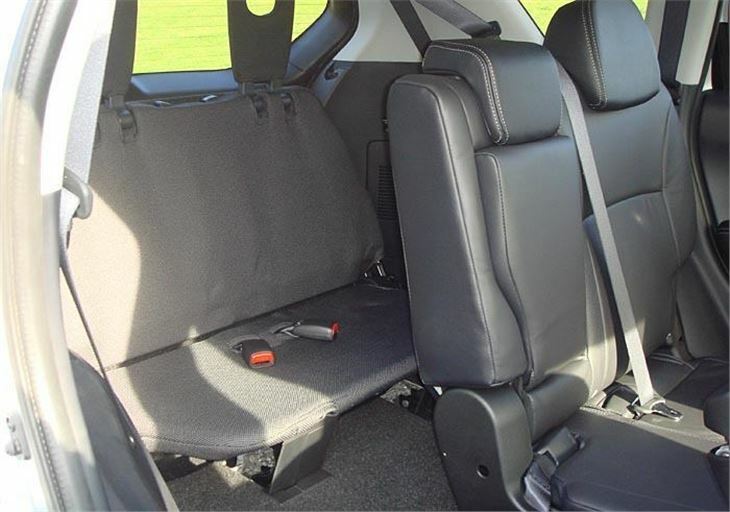 Exactly like the Outlander, a tiny rear bench pulls out of the boot floor, but these seats are so small and legroom so restricted they are only really of any use to midgets and small children. A full size adult could not reasonably be expected to travel in them for more than a couple of miles. With the rearmost seats tucked away there is 589 litres of luggage space to the window line. And the rear end is split between a hatch and a low tailgate, very useful for sitting on at outdoor events, though the hatch does not extend far enough to keep the rain off your legs. 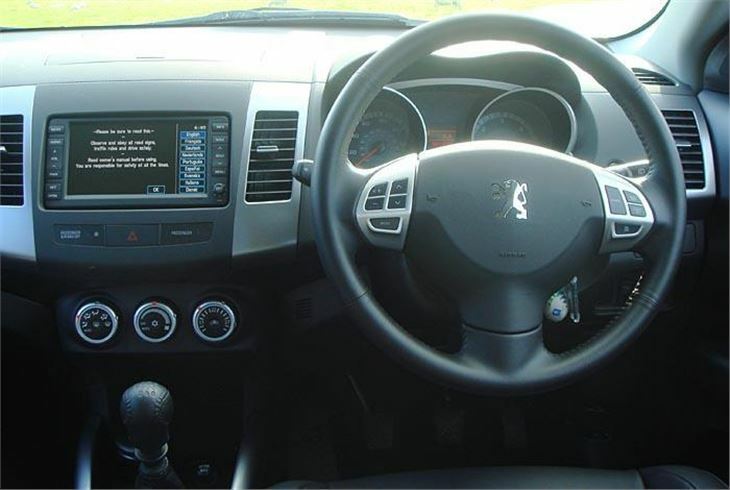 If you go for the optional satnav, it’s a reprogrammable hard disc system like Peugeot’s RT4, but actually Mitsubishi’s, so no need to get stuck with last century mapping. The four-wheel drive system is straightforward. 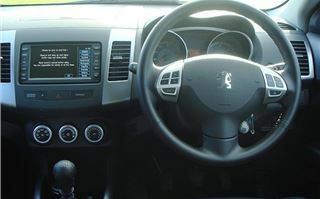 You can select 2WD, which gives front drive only, bringing rear drive into play in very extreme conditions, 4WD AUTO which brings rear drive in at a 70/30 split whenever needed to stabilise the vehicle, and 4WD LOCK which provides a lock to the centre diff distributing power 50/50 front and rear at low speed. As Mitsubishi did with the Outlander, Peugeot sent us off road, through some muddy woods in the rain this time, and the car handled it very well. 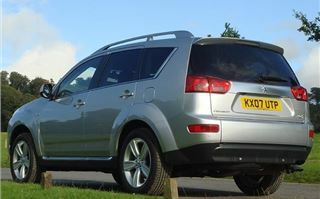 This is a ‘soft roader’ that can do a bit of mild ‘off roading’ if necessary. 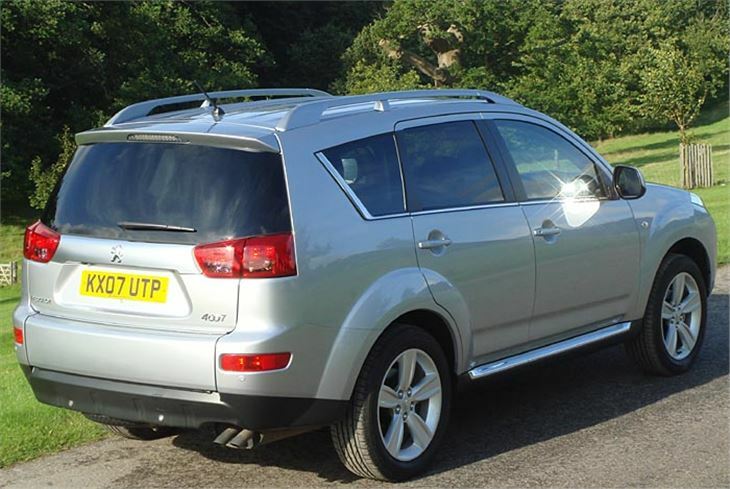 If you had £22k to £25k to spend, needed 7 seats and had to choose between a 4007, a Santa Fe, a Captiva and an Antara, the 4007 is a much nicer car to drive on the road. It’s as good as a Captiva/Antara off road, but not as good as a Santa Fe. There is no automatic option, as there is with the Santa Fe and Captiva/Antara. And the 6th and 7th seats of the Santa Fe and Captiva/Antara are much better. Particularly good in the Captiva/Antara. The on road driving experience of the 4007 is so very much better than the others, that would clinch it for me. But different people have different priorities, which is why I made these differences clear.